Our guest speaker on Sunday morning, August 26th at 10 AM will be Rev. Takashi Miyaji of the Tacoma Buddhist Temple. Sensei grew up in Los Angeles, CA, graduated from UC Berkeley, obtained his Master’s degree from the Institute of Buddhist Studies and is completing his doctoral dissertation on Shin Buddhist Ethics at Ryukoku University in Kyoto Japan. 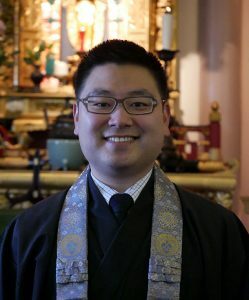 The Tacoma Buddhist Church is sensei’s first temple assignment which began in December of last year.